With the US economy growing in strength, the chances of a hike in interest rates by the Federal Reserve seem to be growing. Already, a strong indication has been given by the US Fed Chair Janet Yellen. With the US economy growing in strength, the chances of a hike in interest rates by the Federal Reserve seem to be growing. 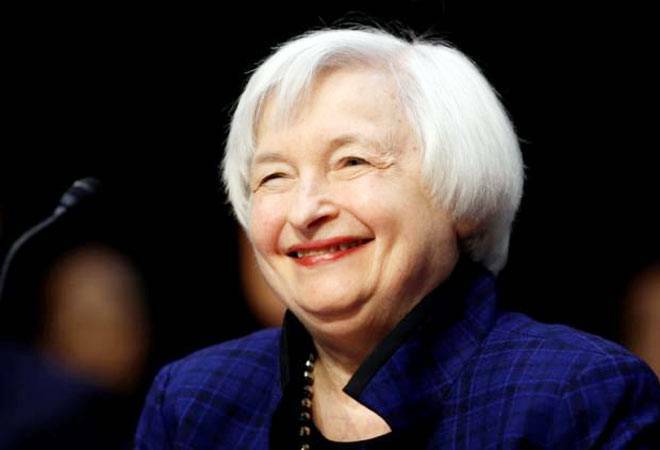 Already, a strong indication has been given by the US Fed Chair Janet Yellen. Currently, US inflation is close to the target of 2 per cent and the unemployment rate is below 5 per cent and it could explain the huge support for a rate hike in March. With days of cheap and easy money over, experts say interest rates have started rising in other parts of the world also, including the EU, Japan and UK. Anurag Jain, Chief Investment Officer, Canara HSBC Oriental Bank of Commerce Life Insurance Company, says, "Jobless claims and unemployment data on March 9-10 are the most significant data till the decision day (March 15-16). We expect that rate hike is more likely to happen in the upcoming policy of US Fed." Indeed, experts say that a rate hike in the US is almost a given. The relevant question now is: How much the US Fed would raise rates by and when? Rajiv Shastri, Managing Director and Chief Executive Officer, Peerless Mutual Fund, says, "The Federal Open Market Committee (FOMC) appears to be confident that inflation is moving towards the targeted 2 per cent level and employment data too supports the idea of a resurgent economy. Over this year, we expect the Fed to undertake 2 hikes, each of 25 basis points." Chirag Mehta, Senior Fund Manager, Alternative Investments from Quantum Mutual Fund agrees. "There is a huge probability of the Fed hiking interest rates in March as well as June. Some are also predicting three rate hikes this year while we believe that the probability of third rate hike is 50 per cent." The likely increase in interest rates by the Fed will impact the emerging markets, including India, with money moving back into US assets- from risky assets to less risky assets. Hitesh Agrawal, EVP and Head - Retail Research, Religare Securities Limited, says, "The US Fed statement pertaining to the outlook for the US economy and consequently the trajectory of future rate hikes will be eyed closely by the market. Any increase in hawkishness in the Fed commentary could lead to a knee-jerk reaction in emerging market equities, including India." Outflows from equity and debt markets domestically are expected with the rise in Fed rates. Sunil Sharma, Executive Director and Chief Investment Officer, Sanctum Wealth Management, says, "The hike will lead to a stronger dollar and rising rates in the U.S. We could expect to see some outflows out of equity and debt markets and negative volatility surrounding the event. Further, the spread between US and Indian debt will narrow, reducing the relative attractiveness of Indian debt as an asset class for US institutional investors." According to several experts, however, markets have largely priced it in and there may just be a short term impact. Lakshmi Iyer, Chief Investment Officer (Debt) and Head Products, Kotak Asset Management, says, "This probability is largely priced in by the market. Hence no major shocks per se are expected in both markets." What should investors do?Experts say long-term bond funds, especially those that invest only in long-term G-Secs, are not for retail investors. This is because timing the entry and exit in these funds is very important. Shastri from Peerless Mutual Fund, says, "Investors may do well to reduce exposure to longer duration and move towards shorter duration, depending on their risk appetite. In the current environment; short term funds (STFs) and dynamic bond funds may do well in the limited risk exposure space." Dynamic bond funds have the flexibility to change the average maturity of the portfolio as per the interest rate scenario. Experts say gold prices have also already factored in a hike in Fed rates. Chirag Mehta, says, "Two rate hikes have already been priced in the gold prices by the market. Gold will remain volatile in near future with a downward pressure but we think it will ease out towards the end of year. Gold prices are likely to go up in long term." In the end, experts say, any dip in prices provide good opportunity to lap up missed opportunities considering that India continues to remain amongst the fastest growing economies in the world.